Only the police and military should have guns ! 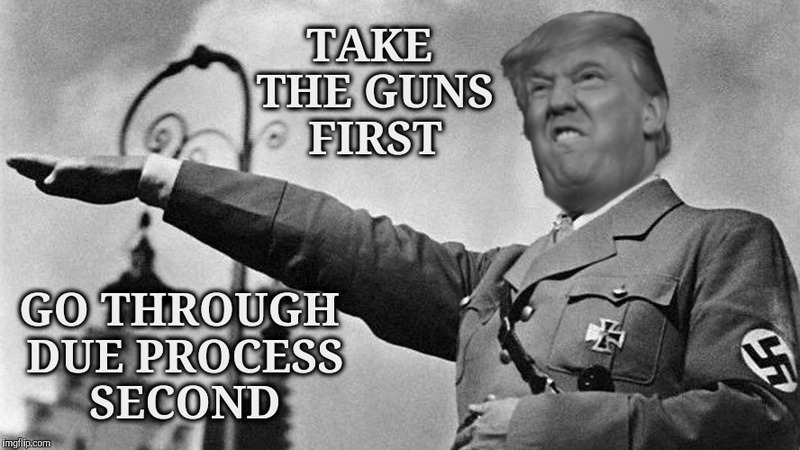 People in pre nazi Germany weren’t allowed to own guns either. Hitler had nothing to do with it. You mean like Trump has now proposed? He made a comment about taking guns away first, then going to court later, essentially ignoring due process. Interesting. Makes literally no sense to actually do. Good meme, OP, btw, SPOT ON! Yeah, I lost a lot of respect for the cheeto when I heard that. Yeah, I lost a lot of respect for the cheeto when I heard that." Lost a lot of respect? LOST? 1. You're supposed to tote the bot partyline and say MSM•CNN•FBI•HillaObamaBenghazi did it. 2. You truly are ignorant and not trolling. Hugs, because you left/right/left/right automatons are simply adorable. I still had a little respect considering that he is keeping a business afloat. He is? Them bankrupting failures? That is illegal, ya know. Consitution being something more than fluff adorning the 2nd Amendment n all. Hey, I said I lost a lot of respect from him. And I meant to say was. I agree. We should put heavier restrictions on Muslims buying or renting trucks. No more stupid than saying "hey, let's make really hard for law abiding citizens to get guns" No more stupid than saying 'If we pass more gun laws people intent on murder will obey them" No more stupid than "hey, let's tell criminals this is a gun free zone so they won't bring guns in here"
I have used my guns twice to defend myself. My having a gun stopped the aggressor in his tracks and I did not have to shoot. If I had not had my guns I probably would not be here today to post anything. 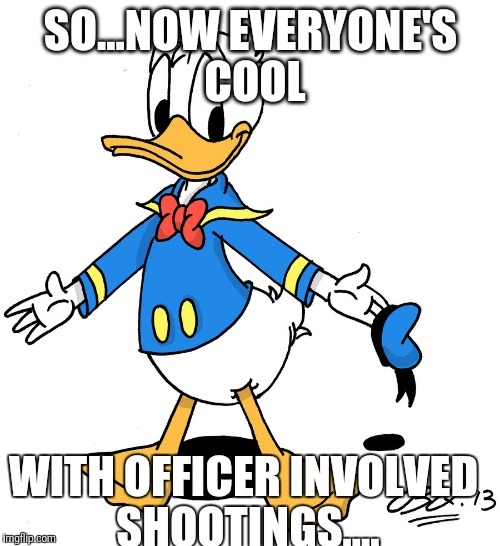 But because I never actually had to shoot and no one died it never made the news. Blood sells. Guns in the hands of private citizens prevent crimes everyday but the media only covers it if someone dies. As much as they hate to cover when a store owner kills a robber or a potential **pe victim shoots her attacker they will cover it...because someone died. They won't cover it when the potential attacker runs off because the intended victim was armed. I'm proof of this..TWICE. Maybe I should have just shot the bastards..I could have got some headlines ! "Guns in the hands of private citizens prevent crimes everyday"
"They won't cover it when the potential attacker runs off because the intended victim was armed." They don't cover it when the attacker runs off because it's not newsworthy, not because no one died. It's not newsworthy BECAUSE no one died. Blood sells. To report that a crime was prevented because the victim had a gun IS newsworthy but does not fit the agenda so they don't cover it. The media has an agenda. When there were thousands of children and people dying in Iraq due to sanctions, they didn't show a single picture. How about when all those people, families, children got mowed down by trucks in Europe? See any graphic pictures of children mashed to a pulp next to their toys? No? But when the Oklahoma City bombing hit, they were damn sure to show the bloodied bodies of babies and tried to pin it on the NRA. I don't see the connection. The Oklahoma City bombing wasn't carried out with guns, so why would the media try to pin it on the NRA? The media always blames the NRA for these shootings. Despite very few (if any?) shooters actually belonging to the organization. Cause their goto story the pounced on was that it was some crazy who supported the NRA. Please show me one single widdie biddie example where a lie so utterly and completely ridiculously retarded was ever uttered by any lying idiot on planet earth ever. - Oh wait, you just did. I just love how the 'both sides' of this fake bot argument just simply keep conviently forgetting the largest & safest City in the USofA, and also the most siginficant, important, diverse, and relevent for everything from the WORLD economy, culture, media... to gun control in effect and working. It's ONLY the center of the planet, so, eh. You know what I finally saw on tv 5 years ago? The Sears Tower. Yup, the only thing of note in Chicago, and not so much as a still photo have I ever seen till then. Yet the 'both sides' of this fake bot argument are so relentlessly focused on that dying city of a nothing of a pig slop corn State, I feel like I know these Chicagoans on a first name basis. Hey, someone better call the thought police, lanosite has gone rogue and mentioned NYC too. Our Russian bosses won't be having it. *beep beep* Timothey McVeigh, drivin thruuuuuuu....... Jihadi style. 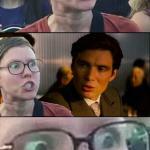 Yeah, if you're not going to reguard my argument at all, I'm just going to see myself out. Argument? Even if there was one, why should I have any regard for it, especially from you no less? Look at what I posted. Do you see an argument? There isn't one. Only simple fact. There is no argument to be had by either of the two 'opposing' camps whose sole aim IS to argue simply for its sake, not the furtherment of knowledge or some other crap. Save your Russian bot argument for another Russian bot. All these sites have been crammed with yous for the last two years. You're a joke. Yeah, sure. One city with a low amount of deaths a year means that gun control works. Screw the many other times where very similar measures were put into place and it hasn't worked. So you can comprehend facts? Good, there's some hope for you then. Look at that, troll you back for a couple of days, and you've become a wonderfully obedient puppy. @SilicaSandwhich, don’t waste your time with jack henoff here. Complete troll. Do you even know what a Pinko Commie and an Nazi is? TRUMP IS HITLER ! 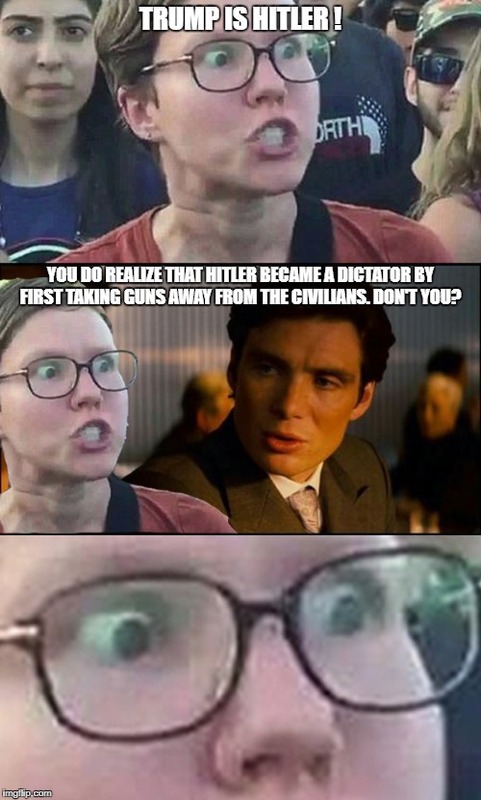 YOU DO REALIZE THAT HITLER BECAME A DICTATOR BY FIRST TAKING GUNS AWAY FROM THE CIVILIANS. DON'T YOU?